A September 9, 2015 article in the New York Times brought to the forefront the work of Paul DeVita, a professor of kinesiology at East Carolina University in Greenville, N.C., and president of the American Society of Biomechanics. Dr. DeVita’s research compared the lower leg and ankle function of young runners in contrast to runners over forty years of age. His initial research in 2000 looked at gait changes with age at walking speeds, whereas his 2015 research data was gathered at running speeds. While the results are alarming, incorporating the study finding into your train ing program will greatly reduce running-related overuse injuries. The over 40-49 age group has seen a huge increase in numbers in the past decade. As a runner who was once a member of the 40-49 age group, I have experience the changes in running performance associated with age. DeVita’s research confirmed a 20% reduction in running speed per decade beyond forty. Both running stride length and lower leg muscle function decline in a linear manner with age. Calf (gastroc-soleus muscle) and ankle dorsiflexion (tibialis anterior muscle) functional strength both decline with age. A reduction in lower leg muscle strength and function shifts the burden of self-propulsion to our hips and glutes which are already physically challenged by prolonged sitting and tight hip flexor muscles. Lower leg, foot, and Achilles tendon injuries become increasingly common in runners over forty. Gradual degradation of muscle and tendon tissue integrity and nerve innervation sets the stage for an increase in running-related overuse injuries. On a positive note, the information provided by Dr. DeVita’s research will serve to guide strength and conditioning programs for runners interested in injury prevention and running performance. Stretching the calf and lower leg muscles, Active Release techniques, dynamic warm-up, and rolling are great ways to improve lower leg muscle tissue mobility. Lower leg, ankle, and foot strengthening exercises should be a part of every runner’s training program, not just those in the fourth decade of life and beyond. Strengthening exercises should include single leg heel raises, heel drops, resisted ankle inversion/eversion/dorsiflexion, and intrinsic foot strengthening exercises. Of course, the gluteal musculature and core are not to be forgotten as older runners rely on these inherently weak muscle groups in the absence of full lower leg and ankle strength. If you have been battling a lower leg, ankle, foot, or Achilles injury, email me your questions to determine how you can not only return to pain-free running, but also prevent future injury recurrence. Strength and muscle/tendon tissue mobility are the keys to running faster beyond your forties! 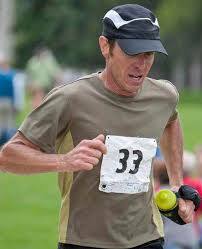 Reynolds G, Why Runners Get Slower with Age. New York Times. 2015, Sept 9. DeVita P, Hortobagyi T. Age Causes a Redistribution of Joint Torques and Power During Gait. J Appl Physiol (1985), 2000, May; 88 (5):1804-11. DeVita P, Fellin RE, Seay JF, Ip E, Stavro N, Messier SP. The Relationship Between Age and Running Biomechanics. Med Sci Sports Exerc. 2015, Aug 7. September marks the beginning of the fall running season. Smoke-filled skies will soon give way to clear, frost-covered mornings. While fall offers some of Missoula’s best running conditions, nine months of running miles often results in fall aches and pains. Lower extremity running injuries impact 19% to 79% of runners. Factors which lead to an increased incidence of running injury include a significant increase in running distance, terrain, or pace, a change in overall body composition or strength, and a lack of adequate recovery or rest following a workout or race. When running-related pain develops, it is important to determine whether the pain symptom is the result of an underlying weakness and/or a mechanical problem located elsewhere in the body. The running body in motion is subjected to multidirectional forces. Our body’s ability to dissipate excess force, minimize impact force, and transfer these multidirectional forces into forward running progress determines our running efficiency. Evaluating a runner’s efficiency through video evaluation is an excellent way to determine potential injury-causing compensations to improve running efficiency. Sapphire Physical Therapy offers video running evaluation which allows runners to watch themselves run in slow motion. A physical therapist will point out any running gait deviations and explain how such deviations may lead to or be the underlying cause of running-related pain. An August, 2015 study in the Orthopedic Journal of Physical Therapy reviewed 974 studies to determine whether or not visual feedback (in the form of video analysis, visual feedback) and verbal feedback are effective in improving running mechanics. The study confirmed that both visual feedback and verbal cues are effective in modifying running mechanics. The key to an effective and useful running video analysis lies in the ability of the physical therapist to detect running gait deviations and translate those into simple cues to be used while running. Running injury treatment and prevention simply makes more sense when pain, weakness, and running video compensation can be related to one another. Below are several examples of simple verbal cues which may be utilized based on possible running gait compensations based on a video running evaluation. Contact John with any questions or comments and learn more about our comprehensive running and physical therapy services at www.sapphirept.com. Knee pain is a common running injury. A rapid increased in mileage, hill training, weakness in the quadriceps, hip, glut, foot, and ankle musculature are contributing factors to knee pain. Lack of stabilization at the hip or lower leg places increased stress on the knee joint. The vastus medialis oblique (VMO) is a key stabilizing muscle during weight bearing knee flexion and extension and warrants further discussion. The vastus medialis oblique (VMO) is one of four quadriceps muscles which extend the knee joint and stabilize the knee in weight bearing. The knee is a modified hinge joint which means it is more complicated than a door hinge. Subtle but important accessory motion occurs with movement in many extremity joints. Accessory rotation in the knee (the femur rotates slightly medially relative to a stationary tibia) occurs during weight bearing, and decreases joint wear and improves patella-femoral joint function. The VMO is the quadriceps muscle responsible for accessory joint motion during the final few degrees of knee joint extension. Building and maintaining strength in the VMO, therefore, is an important component of running without knee pain. The VMO originates on the intertrochanteric line of the femur and adductor muscle aponeurosis and inserts on the quadriceps tendon and tibial tuberosity via the patellar tendon. The VMO is a difficult muscle to isolate during strengthening exercises due to its diminutive size andspecificity. Without adequate VMO strength, however, patella-femoral (knee cap) tracking shifts in a lateral direction during flexion and extension associated with running. Prolonged lateral knee patella tracking leads to irritation of the patella surface and inflammation of the surrounding tissue (patellar tendon, cartilage). While prior joint trauma, osteoarthritis, meniscus injury, and overtraining can also lead to knee pain in runners, the VMO must be addressed during conservative treatment and injury prevention. Additional treatments such as patella-femoral taping and video running analysis may reveal underlying asymmetries which contribute to knee pain. Weight bearing terminal knee extension (TKE) isolates the stabilizing VMO and (if done correctly) facilitates the necessary accessory motion of the knee joint. Emphasis should be on straightening the knee using the quadriceps muscles rather than attempting to “lock” the knee. Strengthening the quadriceps in a functional loading position is important for runners. Focus should be on slow, controlled sit-down motion without the knee, hip, and foot turning inward. There are 4.1 million runners in the United States which is a 30% increase since 2000.1 Nearly 80% of runners sustain at least one overuse running injury per year,2 and 70% to 80% of these injuries occur between the knees and the feet.3 The most common running injuries include patellar tendonitis, plantar fasciitis, iliotibial band syndrome, patella femoral pain syndrome, shin splints, Achilles tendon pain, hamstring strain, stress fractures, and ankle sprain. This month’s Runners Edge article will focus on Achilles tendon pain. The Achilles tendon is one of the largest tendons in the body. It is formed by the gastrocnemius and soleus muscles and serves to attach these lower leg (calf) muscles to the heel (calcaneus) bone. Unique to the gastroc-soleus-Achilles complex is the fact that this muscular-tendon group crosses three joints (knee, talocrural ankle joint, subtalar ankle joint). The Achilles tendon, therefore, is responsible for powering push-off during running and absorbs torsional stress placed upon the associated lower extremity joints. Achilles tendon soreness is common in runners. A rapid increase in running mileage, a drastic change in shoe cushioning or shoe drop, or a significant increase in hill running can all lead to Achilles pain. Poor calf muscle length and mobility as well as poor proximal hip and core functional strength also results in increased Achilles tension during running. Achilles and is referred to as Achilles tendinosis or Achilles tendinopathy. The thickened tendon represents scar tissue formation which will not resolve with rest alone. Treatment of Achilles tendonitis in its early stages should include complete rest from running. It is vital to reduce inflammation by modifying activity level. Anti-inflammatory medication may be prescribed, and ice/elevation will aid in pain reduction. Because the blood supply in the Achilles is limited, healing may take some time. A physical therapist will help determine the underlying cause of your Achilles symptoms as proximal weakness or a muscle imbalance which lead to poor running mechanics. If acute Achilles tendonitis is not treated in a timely manner or if symptoms are ignored, then Achilles tendinosis may develop. The associated tendinosis “lump” of scar tissue decreases the elasticity of the Achilles and may lead to bone irritation at the Achilles attachment (calcaneus). Addressing the scar tissue with properly applied physical therapy cross friction massage, instrument assisted soft tissue mobilization (IASTM), and anti-inflammatory modalities such as Iontophoresis are beneficial. If symptoms do not resolve in a timely manner, orthopedic options such as platelet rich plasma (PRP) injections should be considered. Once pain is gone, running mileage and uphill running should be resumed very gradually. Strengthening the Achilles tendon and calf musculature in an eccentric (lengthened) manner will reduce injury recurrence. Do not ignore Achilles pain. See treatment immediately to expedite your return to running. Because of the unique dynamic musculoskeletal forces and complex synthesis of movement involved in running, treatment of running injuries must not focus solely on static, passive interventions. Physical therapy is a vital component in returning to full running ability following an Achilles tendon injury. Rest and pain relief alone will not insure a full return to running. A physical therapist with experience treating running specific injuries and a firsthand understanding of the mechanics of running will insure a successful return to running. Learn more about our comprehensive running and physical therapy services at www.sapphirept.com. 1 Wilk B, Muniz A, Nau S. An Evidence-based Approach to Orthopaedic Physical Therapy: Management of Functional Running Injuries. Orthopaedic Physical Therapy Practice. 2010; 22:213-216. 2 Van Gent RN, Siem D, van Middelkoop K, et al. Incidence and determinants of lower extremity running injuries in long distance runners: a systematic review. J Sports Med. 2007; 41:469-480. 3 Ballas M, Tyrko J, Cookson D. Common overuse running injuries: Diagnosis and management. Am Fam Physician. 1997: 55(7):2473-2484. Spring in only a few weeks away and the roads and trails are drawing runners out of winter hibernation and winter sports. Whether you are new to running, or have already signed yourself up for a dozen races, spring represents a season of new beginnings. Spring is a great time to assess your running form to maximize your running efficiency while minimizing your injury risk. As running mileage increases, it is important to maintain proper running form. Fatigue associated with less than ideal running efficiency increased overuse injury risk. While overall body fatigue is often obvious, individual muscle fatigue (resulting in running gait asymmetries) is often undetectable until an injury occurs. A comprehensive running form analysis should be conducted by a physical therapist experienced in running biomechanics and running injury treatment and prevention. There are a few simple steps, however, which every runner can implement to improve running efficiency in preparation for spring mileage increases. Whether you are a forefoot, mid-foot, or heel striker, it is important to remain light on your feet as your mileage increases. Listen to your foot strike. A silent runner is an efficient runner.Landing quietly on your feet is possible only if your feet, lower legs, quads, hamstrings, hips, gluts, core, and upper body are strong. The less time you spend on each foot, the shorter the impact duration of each foot strike. Shortening each foot strike duration results in a lower impact force through the body over the distance of your run and a higher running efficiency. Work on running quietly on your shorter runs and gradually implement silent running into your long runs. The longer your stride, the greater the leverage through your hips, knees, and back. Shorten your stride slightly and focus on increasing your turn-over or cadence. Relax your arms, maintain a neutral pelvis (hips beneath you) and drive your knees forward. Running silently is more readily achieved with a shortened stride. Most of us spend a great deal of time sitting each day. Prolonged sitting results in hip flexor tightness, hamstring tightness, abdominal weakness, gluteal weakness, forward shoulder posture, forward head posture, and protracted shoulder posture. Body adaptations secondary to sitting must be addressed to improve running posture. Whenever possible, get up from the sitting position and move your body/joints into positions opposite those found while sitting. Straighten your spine, extend your hips, find and strengthen your gluteal muscles, find your neutral pelvis position, lengthen your hamstrings, stretch your rounded shoulders, and hold your head up. The experts at Sapphire Physical Therapy can evaluate your running gait, posture, detect underlying form or strength issues, and develop an individualized injury prevention and treatment program to meet your individual needs. Call Sapphire Physical Therapy or see learn more at www.sapphirept.com and let us help you successfully achieve your 2015 running goals. As runners, our feet take a beating. Foot pain can greatly impact a runner’s ability to train and race to your potential. Running places 2.5 to 5.0 times the weight of the body through each foot strike. Foot pain, however, does not have to be synonymous with distance running. This month I will explain foot anatomy, preventing toe nail loss, ingrown toe nail prevention, and stress fractures. In next month’s article, I will discuss plantar fasciitis. Understanding the foot and how to avoid a few common foot injuries will enable runners to achieve training and racing goals. The human foot contains 26 bones (28 if you count the two floating sesmoid bones on each foot). The bones of the foot form three distinct structural and functional units. The rear foot is made up of the large calcaneus and talus. The rear foot is designed for weight bearing and articulates with the lower leg bones (tibia, fibula). The mid foot is made up of the navicular, talus, and cuneiform bones. The mid foot has a dual role. It absorbs shock during weight bearing and forms the stability we rely on (the arch) when pushing off to initiate the next step. The fore foot is made up of the five metatarsal bones and 14 bones in our toes (phalanges). Observation of the bone structure of the foot explains why our feet are so uniquely shaped. Foot function is responsible for the unique shape of each bone within the foot. The wedge-shaped mid foot bones allow shock absorption during pronation (weight bearing acceptance), but with muscle contraction the flexible wedge becomes a rigid supporting structure which drives body propulsion. In contrast, the stout calcaneus and talus bones are weight bearing structures. Even though mid foot and fore foot running has been shown to be more efficient and decrease running injuries, humans heel strike when we walk. Finally, the fore foot is the region of the foot which allows us to “feel” the trail or road when we run. Balance, agility, and proprioception are duties of the fore foot. The skeletal anatomy of the foot must be combined with the stability and mobility provided by our connective tissue (ligaments, tendons, fascia) and muscular tissue (Intrinsic: within the foot; Extrinsic: lower leg muscles). The ability to react to uneven surfaces in a fraction of a second and rhythmically run without active concentration is made possible by the neuromuscular function of the foot. Continuous, two-way nerve messages to and from the foot to the spinal cord and brain result in split-second shock absorption, foot work finesse, and propulsion power. Trail runners are particularly susceptible to toe nail impact injuries. Striking rocks with the front of your shoe is often unavoidable and sure to traumatize toe nails. Working on foot placement and agility over rocky surfaces may reduce the frequency of toe nail trauma due to striking rocks head on. Downhill running (especially fast downhill running) can lead to toe nail trauma as the foot shifts forward in your shoe. The nail root, located at the base of the toe nail, becomes inflamed during to impact. If impact is sufficient, the nail may actually avulse from the nail bed, leading to eventual nail loss. Do not attempt to remove a traumatized toe nail as it will shed itself once a new nail is sufficiently established beneath the old nail. Understanding the foot and how to avoid a few common foot injuries will enable runners to achieve training and racing goals. Trimming your toe nails (discussed below under Ingrown Toe Nails) properly will also decrease trauma to the nail matrix and nail root. A shoe with a wide toe-box may reduce the risk of toe impact against the front of the shoe, but proper lacing must be utilized as well. Be sure our mid-foot is secure by proper lacing while allowing your toe the room it needs to spread and absorb impact. The Runners Edge staff can help match your running style and foot shape to a shoe which will minimize trauma to your toe nails. nails must be as short as possible to decrease toe nail trauma and loss. Proper trimming, however, is more important than toe nail length. Remember, your toe nails are designed to protect your toe, so cutting them super short exposes the ends of your toes to impact, trauma, and blisters. Proper toe nail trimming involves a flattened toe nail end. Rounding off the toe nail when trimming the nail actually increases lateral toe nail growth and can lead to the formation of ingrown toe nails. Not only can they be painful, but severely ingrown toe nails may become infected and require medical attention. Excessive impact can break down the structural integrity of the foot (joints, connective tissue, and muscular support). The greatest enemy of the foot, however, is torsion. Bones, joints, and connective tissue function properly when movement is through designated planes. Torsion through a joint or bone, however, greatly increases its chance of fatigue and failure. Stress fractures are often the result of excessive torsion through a bone secondary to inadequate stability (muscle weakness or lack of connective tissue tensile strength). To prevent structural failure and subsequent injury in the foot, runners must regularly address foot and ankle strength, proper joint mobility, and allow for tissue recovery. The experts at Sapphire Physical Therapy can evaluate your running gait, detect any form or strength issues, and develop a foot injury prevention and treatment program to meet your individual needs. Call Sapphire Physical Therapy or see learn more at www.sapphirept.com and don’t let your feet keep you from meeting your running goals.